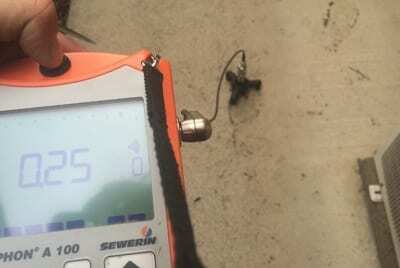 Adept plumbing and gas use acoustic detection methods. Pumping compressed air through the waterlines and then listening along the length of the water line with sensitive ground microphones to hear the air/water mix exiting the break in the line. If the water line direction is unknown then a wire trace can be run through plastic water services and then energized and located with the Rigid scout locator. Once the leak has been located Adept plumbing and gas can then provide an accurate quote to carry out repairs. Think you may have a leak? Use our basic do it yourself leak check to see if your excess water consumption is down to a leaking toilet, tap or a concealed water leak. This test should be carried out over a 30-minute period while no water is being used on the property. Locate water meter. Usually at the front of the property in a covered box near the street. Write down the numbers indicated on the meter at the start of this test. Return to check the meter reading after 30 minutes have passed. If the numbers have not changed then you do not have a leak on the property. IF THE NUMBERS HAVE CHANGED THEN YOU HAVE A LEAK ON THE PROPERTY. Shut off all valves inside the property to toilets, Washing machine, dishwasher and ice making fridge. Repeat steps 1-3. If the numbers do not change then one of the fixtures/appliances isolated in step 4 has a leak and requires servicing. If the numbers have changed then this indicates that there is a concealed leak and you will need to organize leak detection.